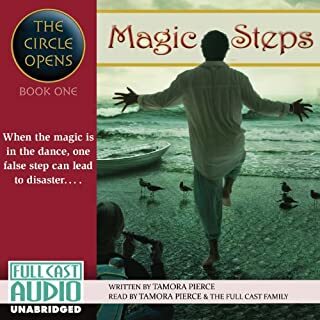 Would you consider the audio edition of Magic Steps to be better than the print version? This books brings characters to life with humor and the perfect amount of detail. She creates a word with a believable society and interesting lore. I am a teacher and I think Pierce is a wonderful author. Sandry is a spirit girl who fills the shoes of a full grow madr at an early age. She is kind, bold and has a strong sense of right and wrong. What does Tamora Pierce bring to the story that you wouldn?? ?t experience if you just read the book? She is the author and she adds the perfect tone to match her words. You know the reader has the author's thoughts in mind cause they are the same person.